iOS devices and their touch-based interfaces offer publishers a way to breathe new life into twice-told tales, and that's exactly what ebook publisher Nosy Crow has done with Cinderella. Gorgeous graphics and interactive elements give the familiar story a fresh new feel on the iPad, iPhone, or iPod touch. The ebook looks spectacular, regardless of the device you use to view it. (Cinderella’s App Store page says the app is created especially for the iPad, but I found it just as enjoyable to read on my iPhone 4.) The backgrounds look like paintings, with plenty of depth and dimension. The paper-cutout look of the main characters will certainly appeal to Cinderella’s young target audience. Cinderella features both Read to Me and Read and Play modes. In each of them, a narrator tells the story and reads the dialogue, which also appears as on-screen text. Read and Play encourages readers to tap on the screen to make the characters speak; that dialogue occurs more automatically in Read to Me. A third mode—Read By Myself—gives young readers the chance to practice their reading skills; you can specify how long the text appears on the screen in the app's settings. 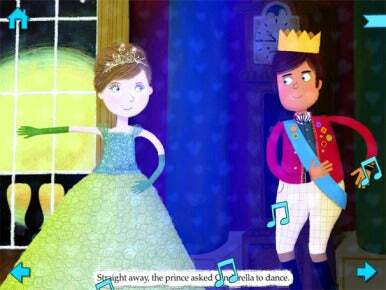 Having a Ball: Tap on the musical notes floating across the screen, and you change the song that Cinderella and the Prince are dancing to. Regardless of the mode you pick, the screens in Cinderella provide plenty of opportunity to explore. You can pan around, pinch to zoom, and spend as much time exploring Cinderella’s world as your heart desires. In testing the app, I read through the story a couple of times and usually found some new detail I had overlooked before. The flipside of this is that there can be a little too much to explore: Unless you're really racing, it can take a while to get through the story. I could imagine that the attention spans of readers on the younger end of Nosy Crow’s suggested 3-years-and-up audience might begin to flag. You can do more than just pan around the scenery in Cinderella or tap characters to make them speak. You can also make the characters flip and spin with a flick of your finger. Several scenes bring you into the story—you can drag around dishes and cups to help Cinderella tidy up or track down the mice, pumpkin and garden equipment the Fairy Godmother needs to create Cinderella’s carriage. I particularly enjoyed a scene at the Prince’s ball, in which you can tap on musical notes to change the song that Cinderella and the Prince dance to. 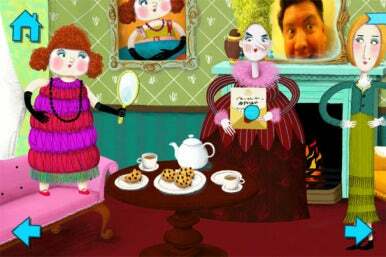 If you’ve got an iOS device with a front-facing camera (an iPhone 4 or 4S, a fourth-generation iPod touch, or an iPad 2 or later), the app will superimpose your face on mirrors in the story—another nice detail that kids should flip over. Mirror, Mirror: In the upper right corner, the author of this review makes a surprise cameo in Cinderella, thanks to the iPhone 4’s front-facing camera. That said, interacting with the story can sometimes be frustrating. Some scenes are cluttered, making it hard to navigate; in the garden scene with the mice and pumpkin for example, I sometimes inadvertently tapped on Cinderella and made her flip when I meant to pan around. For reasons that aren’t entirely clear to me, Cinderella uses the accelerometer of your iOS device, so that tilting your phone or tablet can shift the perspective of the scene. It’s a fine idea in theory, but I found that holding my iPhone at a good reading angle cut off the tops of the characters’ heads. There doesn’t seem to be a way to turn off that feature in the app’s settings. These quibbles aside, Cinderella is a solid iOS ebook that’s likely to delight its young audience. By tapping into the interactivity of the iOS platform, Nosy Crow has really managed to put a unique spin on what otherwise might have been the same old story.